Flaps from the frontal and temporal region have been used for mid-face, orbital, and peri-orbital reconstruction. The knowledge of the vascular anatomy of the region helps to dissect and harvest the muscle/fascia/skin/combined tissue flaps from that region depending on the requirement. Maxillectomy defects are usually covered with free flaps to fill the cavity. Here, we report an innovative technique in which a patient with a maxillectomy with external skin defect was covered with pedicled forehead flap based on the parietal and frontal branches of superficial temporal artery. Difficulties to find the ideal donor site with perfect matching tissues have always made the reconstruction of facial complex defect a tough problem for surgeons. When local flaps and grafts are inadequate, the forehead is a dependable option because of its reliability and anatomic likeness. The forehead flap is acknowledged as the best donor site for the nose and other facial part reconstruction because of its ideal color and texture. In this paper, we suggest pedicled forehead flap as an innovative and ideal choice for facial reconstruction. A 50-year-old male patient reported to our Department of Oral and Maxillofacial Surgery with a complaint of painful ulcer on the left buccal mucosa, which is not healing for 1 year. We diagnosed the lesion as squamous cell carcinoma of maxilla and treated with maxillectomy. The malar defect of size 10-cm periphery was apparent after the three-dimensional clearance was done for the extensive lesion [Figure 1]. The forehead flap was designed taking the frontal branch of the superficial temporal artery as the feeder vessels of the flap [Figure 2]. The total length of the flap was 125% of the defect and was planned to rotate under the skin over the lateral brow region to reach the defect. The flap was deepithelialized on the region, which was supposed to come under the skin of the lateral brow. The prepared pedicled flap was comfortably reaching the defect without any compression and tension at the pedicled end. Now to give the cover to the maxillary defect, we decided to turn the flap over itself to serve the purpose, deepithelializeing it again at the turning point or pivot [Figure 3]. The donor site over the forehead was covered by the split thickness skin graft harvested from the left thigh. The patient was provided with an obturator postoperatively and was recalled regularly. There were no complications with the donor as well as the recipient site [Figure 4]. We recommend the use of pedicled forehead flap for the use of reconstruction of the cheek and malar process as a simple, but innovative technique. Skin flaps were first described by the Indian physician Sushruta in the “Samitha”, written in approximately 500 BC, to replace noses amputated as punishment for theft and adultery. In the 19th century, local flaps were developed in the Western world by several surgeons including Szymanowski, Burow, Esser, Lexer, Joseph, and Davis. Forehead flaps were first performed in America in the 1830s by Warren. 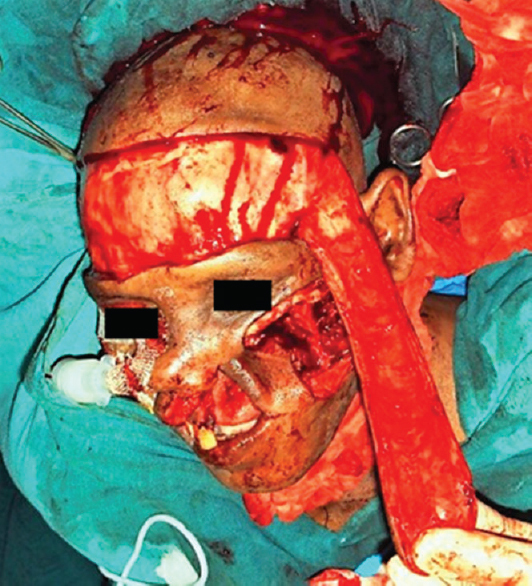 The midline forehead flap was refined by Kazanjian, who described for the first time the primary blood supply, through the supratrochlear and supraorbital arteries, and advocated primary closure of the donor site. Obliteration of the cavities in skull base and mid-face has been a problem with locoregional flaps because of the lack of adequate and bulky vascularized tissue. Andrew et al. used the pedicled temporoparietal fascia for the maxillary defect. However, the fascia alone may not be adequate enough to fill the cavity. The forehead flaps can be a good alternative in such conditions. 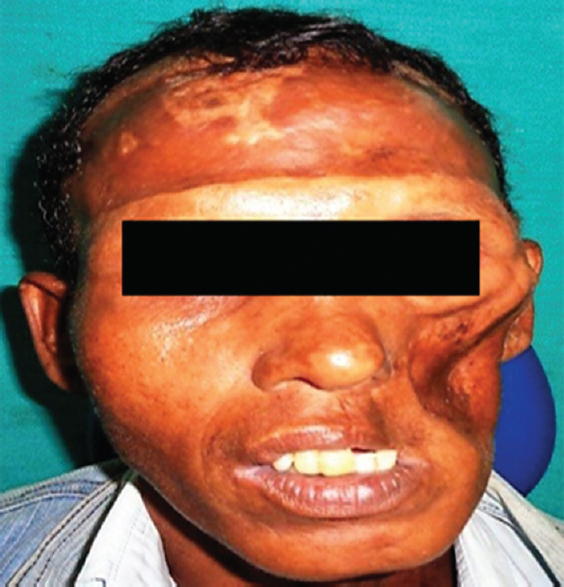 Forehead flaps are a reconstructive mainstay for nasal defects, mid-face, and periorbital region. These vascular networks have good communication with each other. Based on this vascular anatomy, different possible options of combined or individual flaps have been described in this region. Dunham was the first to use the superficial temporal artery included as a pedicle flap for reconstruction of facial defects in 1893. Ozdemir et al. demonstrated the possible options of island skin flaps based on the frontal and parietal branches of the superficial temporal artery in the reconstruction of various facial defects. Cöloğlu et al. have designed the bilobed forehead flap based on the frontal branch for defects involving lateral canthus of the eye, upper, and lower eyelids. This flap involves the reconstruction of nose passed on through the centuries commonly known as the Indian method was popularized when a nasal reconstruction using a median forehead flap was performed by the two Indian surgeons and then published in the Gentleman's Magazine of London. The forehead represents a maximum tissue reservoir for reconstructing large, full-thickness defects of the mid-facial defect. The forehead flap is the method of choice for closure of defects that are not amenable to simpler reconstructive options. This flap is based on the temporal and supratrochlear artery, which crosses the superomedial orbit approximately 1.7–2.2 cm lateral to the midline and courses vertically in a paramedian position approximately 2 cm lateral to the midline. The pedicled forehead flap, equipped with two thick and hairless lobes, can be considered a valuable resource and a valid alternative for complex facial defects in the nasal, orbital (exenteratio orbitae), zygomatic, and cheek regions. Thatte MR, Thatte RL. Venous flaps. Plast Reconstr Surg 1993;91:747-51. Bardach J. 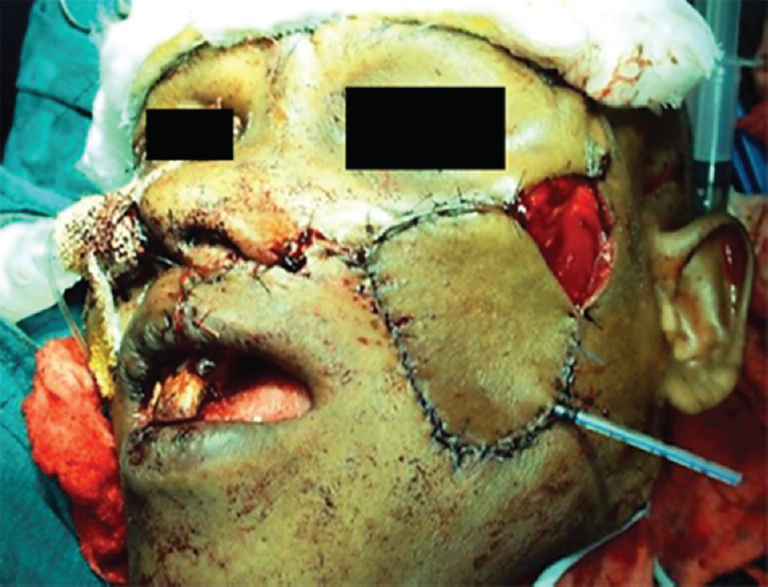 Local Flaps and Free Skin Grafts in Head and Neck Reconstruction. St. Louis, Mo: Mosby Year Book Inc.; 1992. Millard DR Jr. Total reconstructive rhinoplasty and a missing link. Plast Reconstr Surg 1966;37:167-83. Nakajima H, Imanishi N, Minabe T. The arterial anatomy of the temporal region and the vascular basis of various flaps. Br J Plast Surg 1995;48:439-50. Dunham T. V. A Method for obtaining a skin-flap from the scalp and a permanent buried vascular pedicle for covering defects of the face. Ann Surg 1893;17:677-9. Ozdemir R, Sungur N, Sensöz O, Uysal AC, Ulusoy MG, Ortak T, et al. Reconstruction of facial defects with superficial temporal artery island flaps: A donor site with various alternatives. Plast Reconstr Surg 2002;109:1528-35. Cöloğlu H, Koçer U, Oruç M, Sahin B, Ozdemir R. Axial bilobed superficial temporal artery island flap (tulip flap): Reconstruction of combined defects of the lateral canthus including the lower and upper eyelids. Plast Reconstr Surg 2007;119:2080-7. Bickle K, Bennett RG. Combined hinge flap full-thickness skin graft for a through-and-through nasal defect. Dermatol Surg 2008;34:389-92. Potter JK, Ducic Y, Ellis E 3rd. 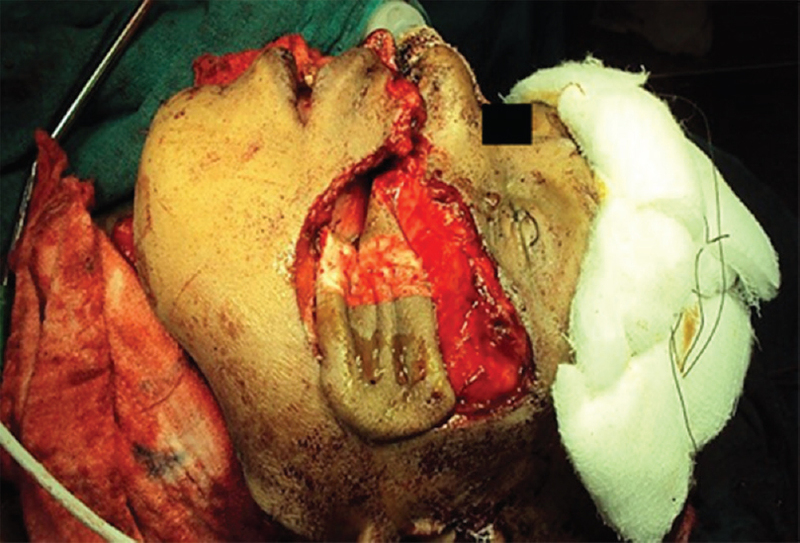 Extended bilaminar forehead flap with cantilevered bone grafts for reconstruction of full-thickness nasal defects. J Oral Maxillofac Surg 2005;63:566-70.